SPOKANE, Wash. - It's not how you start but how you finish. For the second-straight year that phrase has summed up the Spokane Indians' season. After sporting the worst record in the NWL North Division for the first half of the season, the Indians have Redband Rallied back to become North Division Champs for the second half. Spokane clinched the division and a playoff berth with a 3-1 victory over the Vancouver Canadians on Sunday for the Outdoor Expo Day Game presented by The General Store, KISS 98.1, and 590 KQNT. Get Your Playoff Tickets Now!!! 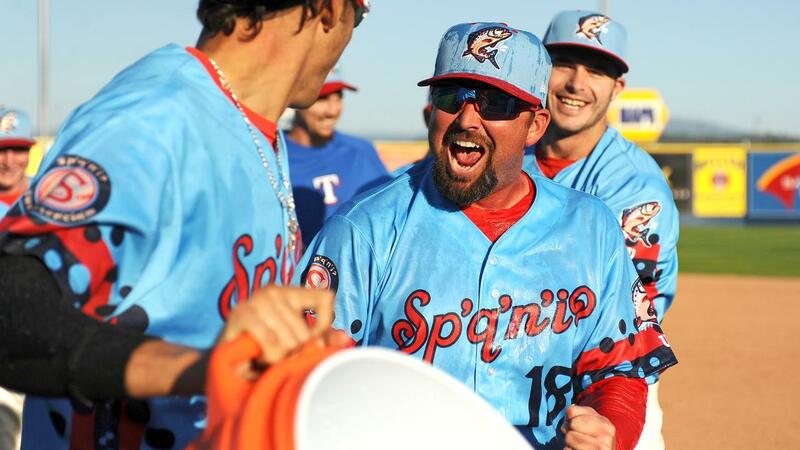 Major Leaguer Alex "Chi Chi" Gonzalez made his return to Avista Stadium for the first time since 2013. It proved to be a timely rehab start with the former first round pick recovering from Tommy John surgery last summer. The righty was dialed-in from his first pitch. Gonzalez threw five perfect innings, facing the minimum and striking out four. He did this all while only throwing 50 pitches. With Chi Chi setting the tone on the mound, it was just a matter of time before the Indians' offense would strike. Spokane got to Vancouver's starter Elio Silva in the fourth inning behind an RBI single from Tanner Gardner. The next batter, Starling Joseph, hit into a fielder's choice that allowed Sherten Apostel to score from third, just beating the throw home. The Indians held a 2-0 lead after four. Spokane snagged an additional insurance run in the fifth inning off the bat of Isaias Quiroz. The catcher hammered a pitch over the leftfield fence for his third home run of the season. It was his first homer since he hit a pair of bombs on June 19th. Spokane took a 3-0 lead after five innings. The run support proved to be more than enough with Francisco Villegas, Wes Robertson, and Emmanuel Clase out of the bullpen. Villegas threw a perfect inning in the sixth. Robertson ran into some trouble in the seventh, but minimized the damage and only allowed one run. He was perfect in the eight to set up Emmanuel Clase's league-leading 12th save of the season. With the win, the Indians are playoff bound for the third-consecutive year. Spokane has won the second half of the NWL North Division the past two seasons and won the first half back in 2016. Playoff tickets are now on sale as the Indians will open up a three-game playoff series with the Everett AquaSox starting on Wednesday, September 5th. Wednesday's game one will be in Everett with first pitch at 7:05 PM. Games two and three (if necessary) will be played the following two day at Avista Stadium. Game two is Thursday, September 6th with first pitch scheduled for 6:30 PM. Game three (if necessary) is slated for Friday, September 7th at 1:00 PM. Playoff tickets can be purchased by calling the Avista Stadium Ticket Office at (509) 343-OTTO (6886) or by clicking the link below. As for the regular season, the Indians and Canadians conclude things on Monday for Season Finale Fireworks Night presented by AAA, KREM 2, and 98.9 KKZX. Join us as we celebrate another great year for the Indians, capped off with a spectacular post-game Fireworks Show courtesy of AAA. Gates open at 5:30 PM with first pitch at 6:30 PM. Tickets for all Spokane Indians home games are available to purchase at the Avista Stadium Ticket Office or at spokaneindians.com. Reserve your seats today by calling (509) 343-OTTO (6886) or TicketsWest at 1-800-325-SEAT.